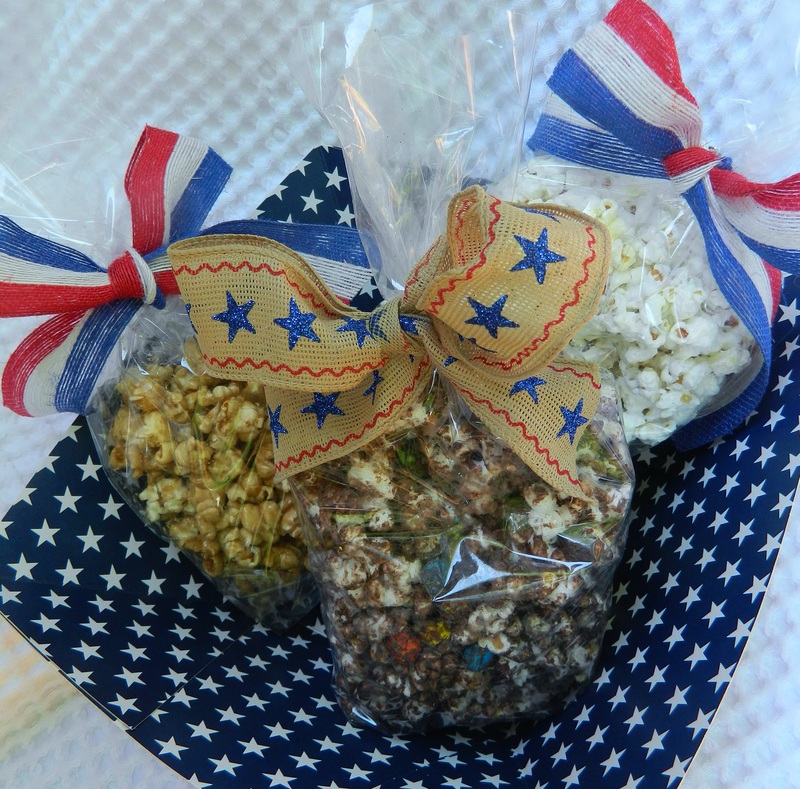 Here’s three flavored popcorn recipes — all dressed up in red, white and blue for Memorial Day. These bags of yum make great gifts. Pop your corn in Canola or coconut oil. No time today to do this? Bookmark it for Fourth of July. This recipe was inspired by Chef in Training who has captured many popcorn recipes from across the blog world. Melt the white chocolate candy melts according to package. Mix half the popcorn with half the chocolate and half the peanuts. Mix the other half together. Salt to taste. Line two baking sheets with wax paper. Pour the popcorn on the trays so the chocolate can set. 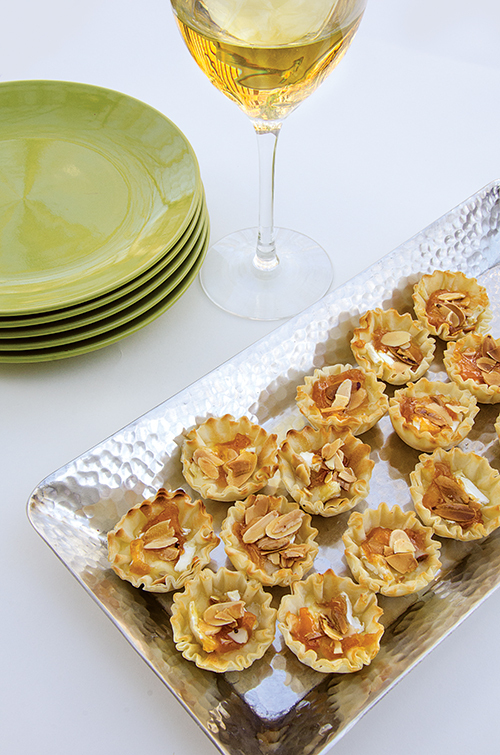 Recipe from Six Sisters’ Stuff. These girls can cook! Pop popcorn and place in a large mixing bowl. In a saucepan over medium heat melt butter. Add brown sugar and whisk together until mixed. Add water. Remove mixture from heat and mix in vanilla extract and baking soda. Continue stirring as the mixture goes puffy. 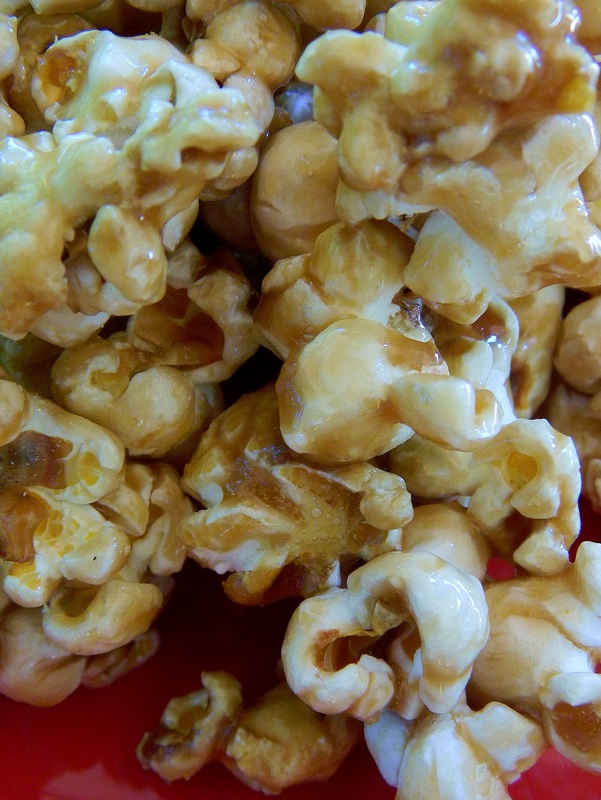 Drizzle cooked caramel mixture over popcorn and lightly stir until evenly coated. Salt to taste. I’m not breaking any ground here because flavored-up popcorn has been a favored treat for a long time. The gourmet stores are charging a hefty price for a bag of the sweet stuff. It’s so easy to make at home for a fraction of the cost. The Chef in Training blog has captured popcorn recipes from all around the blog world. Check them out. One of the recipes inspired the one I made here. My hints: I use Wilton Candy Melts instead of chocolate chips for the melted chocolate. I find them easier to work with. You can find similar products in the grocery store produce section. I don’t prefer microwave popcorn; it’s too full of chemicals and seasonings I don’t want. Pop the corn in a kettle on the stove with either Canola oil or coconut oil. A bag of unpopped popcorn goes a long way. This isn’t the last you’ll hear from me on popcorn, I’m just getting started! Pulse M&M’s® in a food processor or coarsely chop M&M’s® (put in a plastic bag and pound with a rolling pin). Melt the chocolate candy melts according to package. 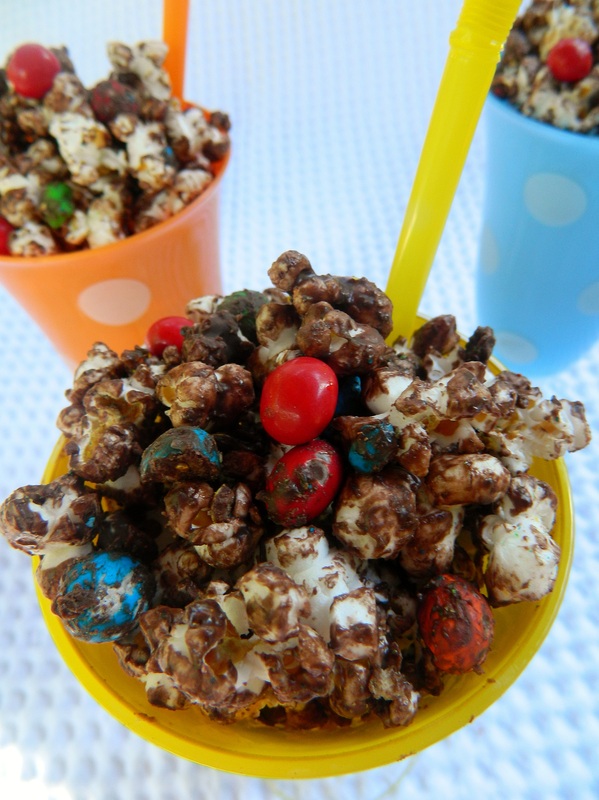 Mix half the popcorn with half the chocolate and M&M’s®. Mix the other half of the ingredients together. Store in air-tight container (if it lasts that long!). And birds and flowers once more to greet. We placed it cavalierly on the deck rail and within a few days bluebirds came shopping for a home. They bought while we watched. 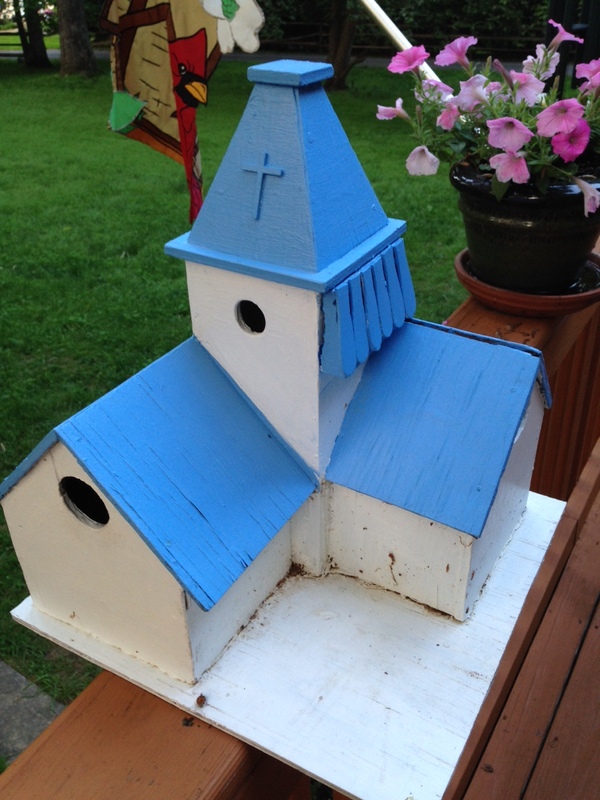 But, it’s not a bluebird house! 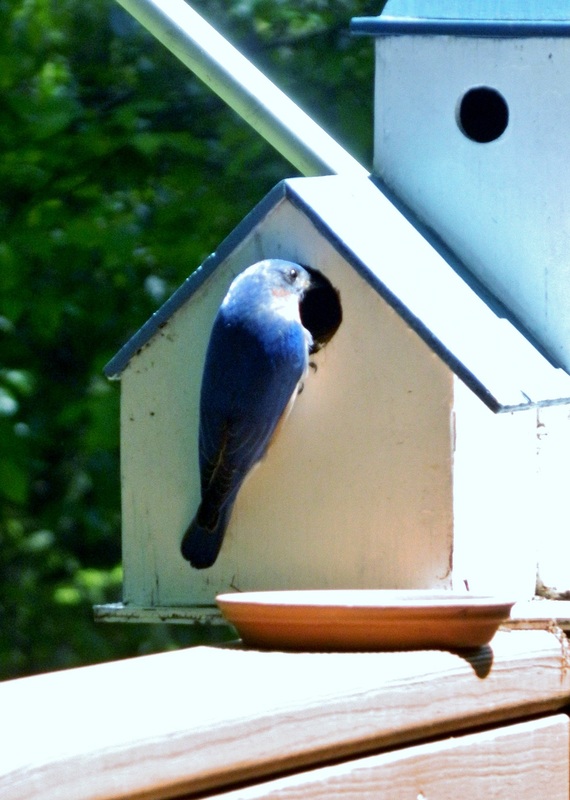 Did you know that the male and female bluebird mate for life? Do you think it was coincidence that they found our house? It’s not an ordinary bluebird house high up in the tree – it’s more like a rambling Victorian with many rooms built for a large family. And, it sits in plain sight of where we can watch up close. They’ve never been timid or spooked. They are love on display. There are four blue eggs in the nest inside right now. When you lay out the welcome mat, the most unlikely guests show up. This is the fourth year for the house and its resident bluebirds. It was looking worn so I remodeled it last fall before putting it away for the winter. Same colors, just a few added wooden touches. When the eggs hatch the parents will feverously go in and out to feed the babies insects, crickets, and larvae. After about 30 days the parents stop feeding the birds. Ready to fly, the baby birds leave the house to find their own food. We remove the roof and clean out the house and watch…a second family usually moves in before summer’s end. 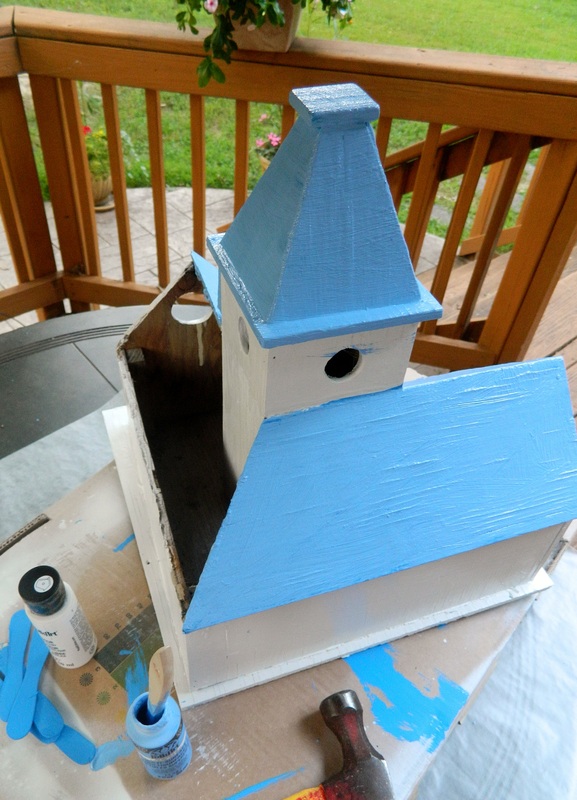 Remodeling the birdhouse after three years of occupation.